I recently met with a client who was arrested and charged with a DUI after he had pulled over his car to take a nap because he was afraid that he had too much to drink. You do not have to actually be driving your car to be charged with a DUI. You could be charged with a DUI as long as you had actual physical control of a vehicle on the public roadway. So as long as you were in a vehicle and you had the keys near you, the law will consider you to have been in actual physical control of the vehicle. In the case I was recently consulted for, the client had been at a bar with some co-workers after work. He had been drinking when he decided to go home. His car was parked down the street from the bar. When the client entered his vehicle he immediately realized that he was in no condition to drive and fell asleep in the front passenger seat of his vehicle. The vehicle was not running but the car keys were in his pocket. An off-duty police officer saw him sleeping in his vehicle and started tapping on his windshield to make sure that he was okay. After the off-duty officer was unable to get a response from the client, he called the local police to report that someone may be unresponsive inside of a parked vehicle. The police officer arrived and was able to wake up the client. When the officer made contact with the client he noticed a strong odor of alcohol coming from his breath and the client appeared to be under the influence of alcohol. The police officer had the client exit the vehicle and perform field sobriety tests. The police officer arrested the client for suspicion of being under the influence of alcohol and took him down to the station. At the station, the officer requested that the client take a breathalyzer test and the client refused. In spite of there being no breathalyzer test, the client was charged with a DUI and given a court date. In Illinois, if you take a breathalyzer test and your blood alcohol level is .08 or above, you will be facing a mandatory 6 month suspension of your driver’s license if this was your first DUI. If you refuse to take a breathalyzer test, you will be facing a mandatory 12 month suspension of your driver’s license. The suspension of your driver’s license will go into effect 46 days after the date of your DUI arrest. 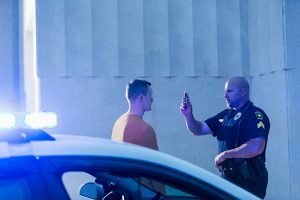 The same law that provides for the suspension of your driver’s license for a DUI also provides a mechanism by which you can challenge the suspension in court. In order to challenge a suspension of your driver’s license for a DUI, you must file a Petition to Rescind the Statutory Summary Suspension before the same court that is hearing your DUI case. The client wanted to know whether he had made the right decision to refuse to take a breathalyzer test. I informed the client that it was impossible for me to answer that question without having all of the evidence for his case. I explained to the client that there is no doubt that without a breathalyzer test, it’s much harder for the state to prove him guilty of a DUI. But there’s two ways to be guilty of a DUI. The first is when there is a breathalyzer test which indicates a blood alcohol level of .08 or above. Since the client refuse to take a breathalyzer test, he was not being charged with a DUI in that way. He was being charged with being under the influence of alcohol based on all of the evidence in the case. I explain to the client that if the state is able to prove to a judge, beyond a reasonable doubt, based on the testimony of the police officer and the dash cam video, that he was under the influence of alcohol, he could be convicted of a DUI without a breathalyzer test. So in addition to being guilty of a DUI, he would still have to take a 12 month suspension of his driver’s license because he refused to blow. Obviously, the best move that the client could have made that evening would have been to not get behind the wheel of his vehicle if he believed that he had too much to drink and was under the influence of alcohol. But since he did get into his vehicle, the client would have been much better off if he had parked his vehicle in a private parking lot. A private parking lot is not the public way. It is not a public roadway. So if the client had refused to take a breathalyzer test, his license would not have been suspended because he was in a private parking lot and not on a public road. He could still be charged and prosecuted for a DUI, but without a breathalyzer test, the state would have a much more difficult time proving him guilty of a DUI. James Dimeas is a nationally-recognized, award-winning DUI attorney who has been handling DUI cases throughout Chicago, Cook County, DuPage County, Kane County, and Lake County, for over 25 years. James Dimeas has been named a “Best DUI Attorney.” Expertise named James Dimeas a “Best Criminal Defense Lawyer in Chicago.” The National Trial Lawyers have named James Dimeas a “Top 100 Criminal Defense Trial Lawyer.” Recently, The American Society of Legal Advocates named James Dimeas a “Top 100 Criminal Defense Lawyer in the State of Illinois For the year 2018.” The American Institute of Criminal Law Attorneys have name James Dimeas a “10 Best Attorney for Client Satisfaction.” AVVO rates James Dimeas as “Superb”, the highest rating possible for any DUI lawyer in the United States. If you are facing a DUI you can contact James Dimeas anytime for a free and confidential consultation. You can always talk to James Dimeas by calling him at 847-807-7405. Can You Be Charged With a DUI If You Pull Over “To Sleep it Off”, by James G. Dimeas, Chicago Criminal Lawyer Blog, November 9, 2018. Arrested For a DUI. Warnings to Motorist and Notice of Statutory Summary Suspension. What Does This Mean?, by James G. Dimeas, Chicago Criminal Lawyer Blog, August 21, 2018.